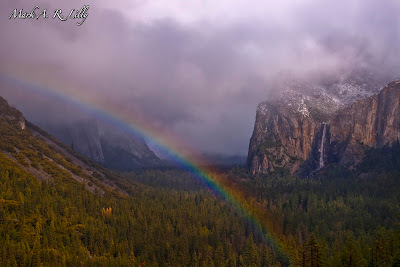 The magical rainbow was definitely short lived; however, I will never forget it arching clear across Yosemite Valley… Now waiting for sunset… By the time the sun dipped behind the mountains the entire valley was engulfed with low clouds… Once it was obvious that there wasn’t going to be any magical light, I packed up my gear and headed for the jeep… Eager to get another glimpse at the rainbow, I quickly fired up my laptop and began processing! So now the big decision is do I stay in Yosemite Valley for the night and hope for a decent sunrise or do I begin an 8.5 hour drive to Southern CA then north on 395 in order to get to Mono Lake and the beautiful Eastern Sierras? I decide to take a short “nap” in the jeep and wait for sunrise in Yosemite Valley… I am about 1 hour into my nap when all of the sudden there is pounding on my side window and three tactical flashlights are blazing into the jeep… The jeep was surrounded by 3 Yosemite National Park police… I guess I shouldn’t have been taking a nap in that particular area… The nice gentlemen with the tactical flashlights, may have ruined my vision permanently, are running my driver’s license to see if I am wanted on any “weapons or drug” charges… I tried to explain to the park police that I was only taking a quick nap so I could get up and shoot star trails… I guess it is tough to comprehend… Anyway, they told me I needed to head to Camp 4 to continue my nap. and once again the flashlight is shining into the jeep! My Response: With a sarcastic laughing I respond, “Thanks for the information”… Guess he didn’t realize that Route 89 is closed! So after filtering out all the misinformation and putting together some facts I have read about the area online with the help of the fine gentleman in the “3rd Outdoor Sports Store” I have arrive at a plan and an area of interest! Can’t wait to get some sleep!